Ragwort is a native perennial plant; the erect, grooved, brown-streaked stem grows from 1-2 feet high and bears alternate, oblong or lanceolate, pinnatifid or lyrate leaves. There are also coarsely toothed basal leaves which are cordate-ovate or reniform, long-petioled and sometimes purplish underneath. Flower heads with golden-yellow rays in flat-topped clusters and brownish disks grow in terminal corymbs from May to July. Highly variable. Other varieties: Common groundsel (S. vulgaris); European ragwort (S. jacoboea) The two related plants; common groundsel and European ragwort, have similar medicinal properties and are said to affect the liver (not necessarily favorably). 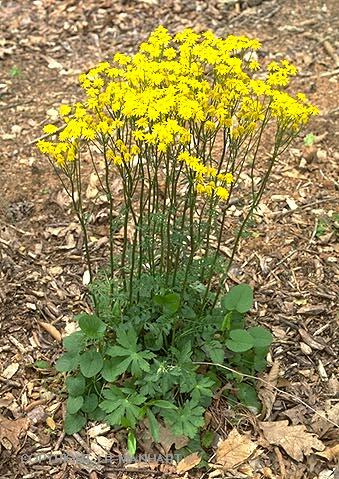 Common groundsel is a widespread weed that can be found in gardens, fields, and waste places all over the world. European ragwort is now a naturalized plant of eastern Canada, the northeastern United States and individual localities elsewhere. The medicinal use of these plants without medical supervision is not advisable. Found in marshes, along stream-banks, swamps, and in other wet areas from Newfoundland to Florida and westward to Wisconsin and Texas. In Sussex, England ragwort is called ragweed. Ragwort is used for leukorrhea or suppressed menstruation. Native Americans, early settlers, and herbalists used it to speed childbirth and to induce abortion. Recommended for gravel and other problems of the urinary tract. Useful for rheumatism, sciatica, joint pains, lung ailments, dysentery, diarrhea, dysmenorrhea, lumbago, prostatitis, wounds, bronchial asthma, constipation, ulcers, colic, intestinal problems, blood purifier, high blood pressure, canker sores, chronic sores, coughs, and colds. Fluid extract: take 1/2 to 1 tsp. in a cup of water. Ragwort contains toxic alkaloids which are known to be poisonous to livestock. Many ragworts of the Senecio species contain highly toxic pyrrolizidine alkaloids. Care should be exercised to identify Senecio aureus before use and even then medical supervision is warranted. Senecio aureus is distinguished by the heart-shaped leaves at the base of the plant.